Richard was manager and coach to the Ireland Triathlon team at the 2008 Beijing Olympic Games and has commentated at the London 2012 Games and on the Henley Swim. He has been coaching since 2007 and now coaches several full time triathletes whilst still competing himself. He not only runs runs Open Water Swim.co.uk but he also coaches Front Crawl Swim Clinics and Turbo Torture sessions. Richard, also known as “The Fish”, began his triathlon career having graduated from Loughborough University in the late 1990s with a BSc in Chemistry and Sports Science whilst being captain of the Loughborough Swim Team. With a strong swim background he realised he needed to master cycling and running before he could compete on the bigger stage. 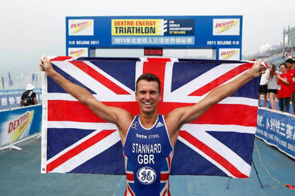 Richard confirmed his status as one of triathlon's fastest swimmers by winning the London Triathlon swim section for ten consecutive years between 1997 and 2006. He is the current British Masters record holder in the 200m free, 400m free, 800m free and 1500m free categories.